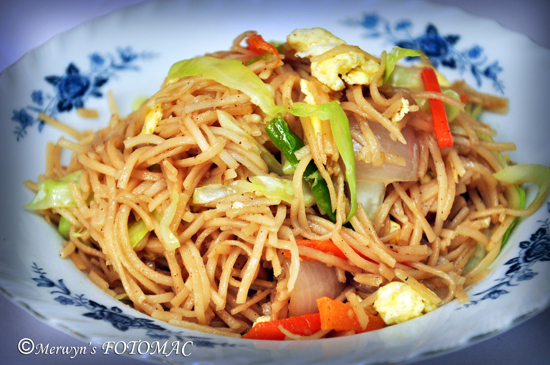 Hakka Noodles is always welcome as it is very delicious & nutritious. It can be prepared in a very short time. In every home, you will definitely find some vegetables & eggs in the fridge. It is advisable to have some boiled & cooled noodles, steamed rice & chopped & julienned vegetables in the fridge so it is handy to fix a quick meal especially when one is hungry. Working people, bachelors & homemakers will find it easy to dish out a tasty meal in minutes. In Pune, we get these lovely thin Dragon Noodles which I used to make this wonderful dish. We enjoyed these Egg Hakka Noodles with Chicken Pineapple Oriental which I posted yesterday. Do try this recipe.. Bon appétit ! Light sprinkle of Pepper pwd. In a sufficiently large & wide pot boil about 3 litres of water. When the water comes to a rolling boil add the noodles; stir & let it boil for about 2 mins. Drain the noodles using a colander or a strainer. Pass the noodles through running normal/cool water; toss the noodles while doing this so that the noodles are no longer sticky. Drain completely & toss with a tsp. of oil. Keep aside. In a sufficiently large wok, heat sesame oil till hot. First saute the garlic & green chillies & then add the grated ginger & stir fry briefly till rawness disappears. Do not brown the same. Then add the carrot, onion & stir fry for about 2 mins. Next the cabbage & toss. Do not over cook the vegetables. Pour in the soya sauce, sugar & mix. Now add the noodles; stir fry & keep tossing. Sprinkle some pepper & toss again. Now in a fry pan add a tsp. of oil & fry the egg omelette. Cut the omelette into strips & add to the prepared hakka noodles & toss well till well mixed. Serve hot with Chicken Pineapple Oriental or gravy of your choice. Julienned vegetables cook faster; retaining the crunch enhances the taste of the stir fry. While adding vegetables to the wok, maintain the order i.e. veggies which take longest to cook should be added first to the wok. It is better to add spring onion greens last; just before taking the wok off the heat. You can use a combination of various vegetables as well as Chinese vegetables & different stir fry sauces of your choice. You can use seafood or chicken if you so wish. If the noodles are too dry before adding to the wok for stir fry, you must quickly pass through running water, drain & add to the wok so they will not be sticky. Rinsing in water removes the excess starch from the noodles & makes it springy. Instead of making an omelette separately, you can scramble it with the vegetables if you like it that way. Keep tasting in between to check salt; use salt sparingly as soya sauce & other sauces contain salt. If using fresh noodles, boil it for a shorter period. Boil noodles al dente as it gets cooked again in the stir fry. I love Goan food, have tried most of your recipes, they are awesome, thank you so much Hilda !